Bought 5 items and got 4 free gifts! Like a few months ago, lol yes I'm still a bit behind, but anyhow I've bought these before Christmas when there was this huge deal going on. 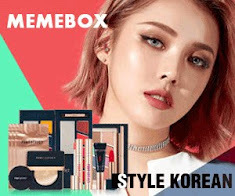 Buy 4 or more items and get 40% off your entire order plus when you spend more than €25,00 you get 4 free gifts (and I also got free shipping). So I said hell yes, let's shop! Ready for my review?! The first two I've bought together for €8,40, I got the third as a gift, and all are 250ml. 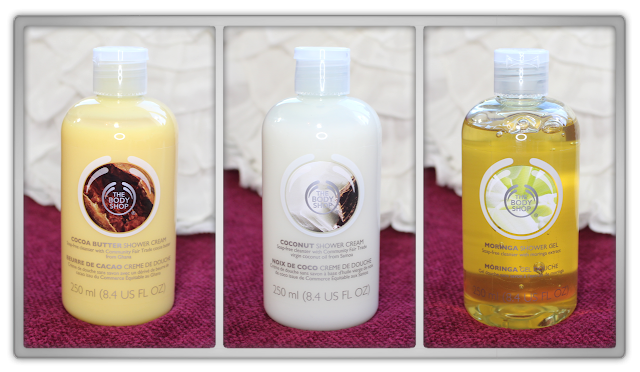 Also for my full scent review on all 3 shower products, go here. I'll now mainly give a scent update. Sadly this product smells bit off but not the expired kind of "off". How I love the scent from the body butter and the lip butter, how weird this scent is. They are all from one scent product line but this one really smells not nice. 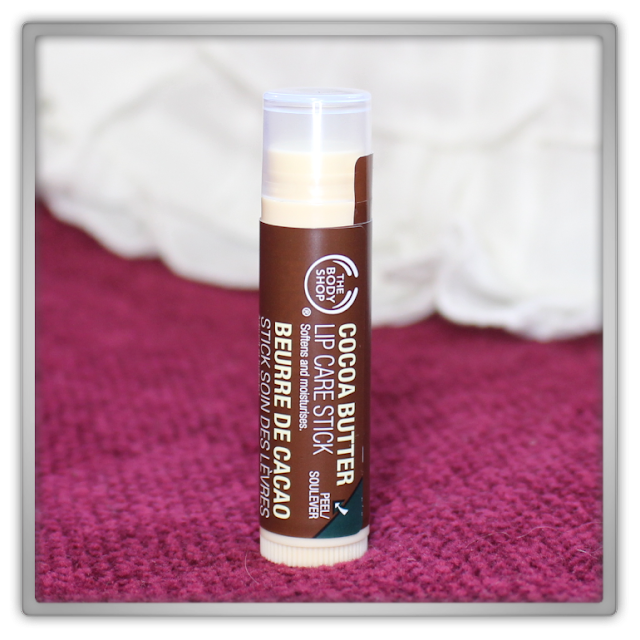 The cacao butter scent I get from the body butter and lip butter is a cacao scent (not chocolate) but cacao in a grownup way. A kid might not like it. But this smells like nuts and floral crap mixed together. It doesn't smell any better when you mix it with water, then it even get worse. This one smells like coconut! Same scent as the body butter scent. But I came to the conclusion after using the body butter for a while I couldn't eat coconut bread anymore. If I would close my eyes when eating that,, it kind of was like I was eating my body butter and also the other way around, like smudging my food on my body. some scents smell similar to food and it's nice but this is just too much realistic. 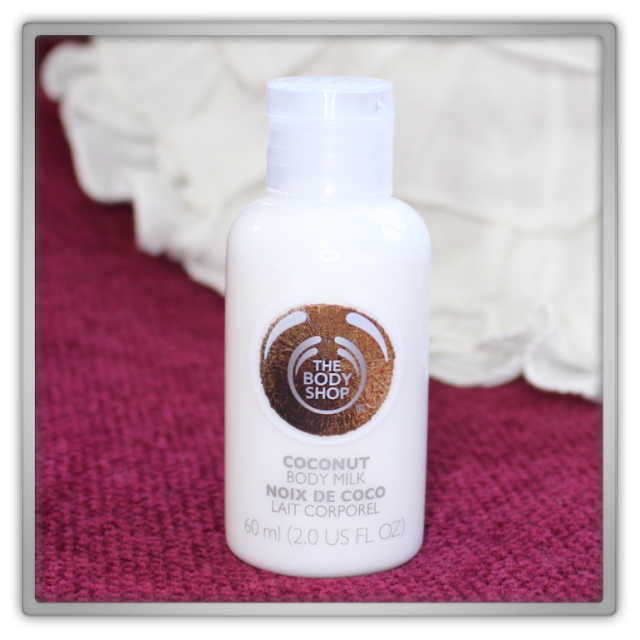 So I quit eating coconut bread and keep using my body shop coconut products! When you use this in the shower the scent gets softer, not less intense, but more in a huggable way. I really like that! I'm not surprised that this is one of their bestsellers. This scent is so amazing and the same as the body butter! It's so light weight and up lifting. Perfect for spring and morning showers! I can't get enough of it, one of my favorites! I need more of this scent!! This was also a free gift. I really love the scent of their shea butters! It's a really calming caring body scent. This body spray smells exactly the same as the shea body butter. Personally this scent really reminds me of bodycare and bedtime. So I only use it to spray on my sheets (it does not bleach btw) or when I've planned to stay at home. I do not think this is a scent to "show off" with. Maybe strawberry or green tea spray is nice to wear outdoors. But shea smells like really body care products. If I would smell it on someone else outdoors I would directly think that person just came from the showers or something. you get the idea. It's lovely for at home days and then I absolutely love, love, love it! I've bought this for €4,20. When I was searching for products to reach €25 ;), I found this and thought; if I would really need it. Then, yes! Because I feel my hands are getting stripped from moisture by our grocery store brand soap. 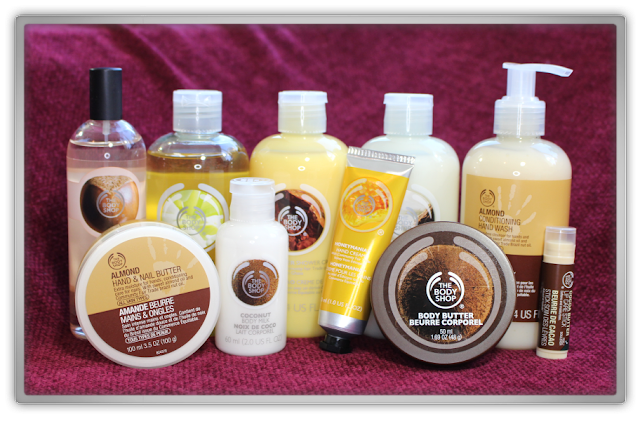 Also because the Body Shop can be quite rich and creamy in these "creamy" type of products, much be good. My goodness best soap ever! I've tried a lot since we have very hard water which dries out my hands so much. But hand wash is amazing, so moisturizing, but cleans so thoroughly! btw the scent is to die for, truly! This smells like my Alpro Soya Almond dessert, which I love and eat everyday! Luckily there is a faint soap scent somewhere deep inside the product, so I can still keep eating my dessert :D I'll repurchase forever! I've bought this one for €3,00. So this is now also sitting in front of me (always). This lip butter and the almond hand butter are my must haves at my desk! The feeling of this lip butter is amazing! It's similar to the Burt's Bees ones, but as those are more "heavy" to apply; this one glides onto the lips. They both do give the same amount of moisture to your lips and holds it. The scent is like the body butter, which is so good! You can read my full scent review here. As a lip product this scent is also very pleasing, since it kind of takes away the urge to get a cookie or whatever. The scent is very soft and lingers. When you taste it, you don't taste the scent, you actually taste nothing. I only have a few lip care sticks I really love and this is one of them! I've bought this little one for €2,40 to check if a body milk was something to try for Spring & summer. Only if body butters are killer to have on your skin in those seasons. This scent is identical to the body butter coconut scent, but I must say this one smells more lightweight. Would be funny if that were because of the concystency :). About that, it's really a milk. It's way more runny than a lotion, but it spreads out amazing and absorbs super fast! I think this really is a much have for spring & summer when the weather is really killing you. I like this scent, but I love the moringa scent so I probably buy the full size in that scent. To me, now is the time for coconut scented things.. In summer I want fruit & flowers! I've received this little one as a free gift too. I've already done my review on this, which you can read here. Always handy an extra bit of butter! I've also received this as a free gift. 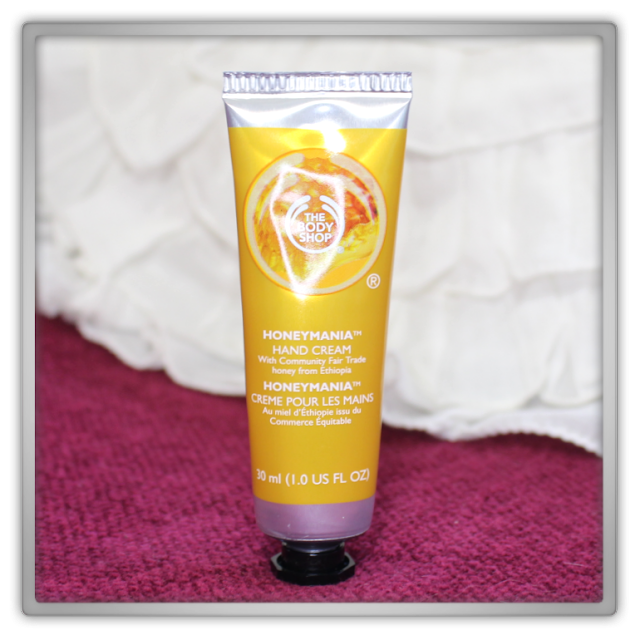 I absolutely love the Honeymania products! 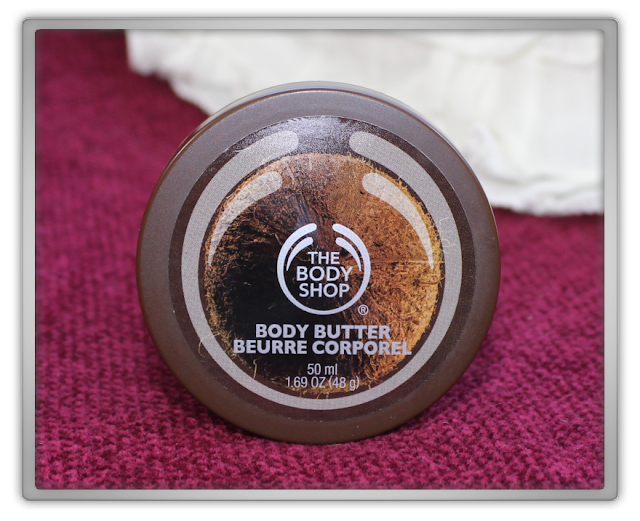 It's how I discovered the Body Shop, here you can see my first review on this, which is in Dutch so don't try lol! But in short; this scent is not like real honey at all. When you smell it it does remind you of honey, and it's sweet just as honey. But when you open a jar of honey from your grocery store, that is true honey. This scent is just so sweet and perfect for spring and summer. The Honeyaania scent is also one of my most favorites. 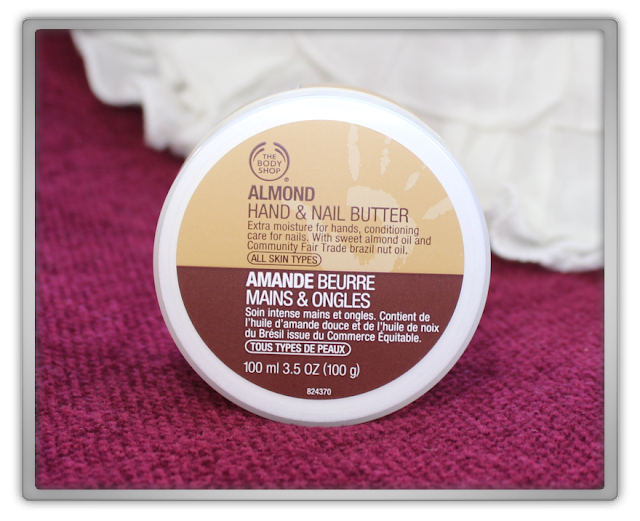 The hand cream feels very nice, bit more sticky compared to the almond hand butter, but still a great product... Honeymania hand butter would be a nice product! But I'll rather buy other products from the Honeymania collection and stick with my almond butter.